In recognition of our dear teammate, the Georgetown Running Club has established an annual award in Nina's memory that recognizes a teammate who exhibits Nina's passion for service, drive for excellence, love of running, and humility. We are pleased to announce the first recipient, Dickson Mercer. From the GRC announcement: Two of the many wonderful qualities that we will always remember about Nina were her passion for running, and her dedication to public service. Because Dickson shares those qualities, he is a fitting winner of the inaugural award in Nina's honor. Dickson is an experienced and accomplished marathoner who is not known for his speed, yet in 2015, at age 33, Dickson ran his first full track season since college because he wanted to have some fun with the sport he loves. The results were impressive, capped by his huge PR of 8:52 for 3000. Dickson also has a history of public service as demonstrated by his work, along with his wife Emily, in the Peace Corps in Niger, and his demanding stint as a guide for elite visually impaired runner Aaron Scheidies in the 2012 Wilson Bridge Half Marathon. Dickson has also dedicated himself to GRC, and his contributions to the team include sharing his vast expertise in the marathon with his younger teammates. Nina and I met at Middlebury’s summer Arabic language school in 2010. Everyone had to take a placement test, and I tested into a class that was too advanced. I got to the class early and everyone was already chatting in Arabic about their far more accomplished backgrounds. None of the kids looked to be my age, some had graduate degrees, and many had clearly already studied or lived in the Middle East. Lucky for me, there was Nina. She and I both had just finished our sophomore years of college. I can still picture her sitting at the table on the first day, looking cheerful and eager to begin class, but most importantly to me, she was the only friendly face in the crowd. We sat together, getting to know one another. Nina never put on airs, she is one of the most modest people I have met, especially given her many many accomplishments. The Middlebury program required everyone to speak only in Arabic for 10 weeks, so we had numerous hours for small talk and chit chat with that limitation. With Nina, the chit chat could run for hours, because even though she was younger than most students, she had great stories about her worldly life, passions, and interests and could convey them very well in the language. She was so easy to talk to. Within a week of the program beginning, I realized the class with Nina was too advanced for me, and so I dropped down to a lower level. Nina stuck it out as the youngest girl in her class with the fewest number of courses of formal Arabic instruction. She was so determined to challenge herself and disciplined enough to reach her goals. While we were in the same class, we worked together on the homework. When I dropped down a level, Nina continued to help me with my homework and answer my questions throughout the program. Nina was incredibly generous with her time in helping others, no matter how busy she was. This is what she loved to do. And she loved the study of Arabic and how it brought her to interact with others. Nina talked about how she was happiest when she was studying abroad in the Middle East, because Arabic was her favorite subject, and being there was a chance to study that subject at all hours of the day, in every situation. Whether it was sitting in class, giving directions to a cab driver, hanging out with her local language exchange partner, or running past the vendors on the Corniche in Alexandria, Egypt, she was soaking up the language just being in the Middle East. Two weeks ago we went for lunch and when talking about her future, she said that she was interested in translating fiction from Arabic into English. She loved the idea of entertaining two of her passions. On top of her rigorous course load in her final semester of her Arab Studies program at Georgetown, she took a creative writing class in the English department and really enjoyed it. Nina Brekelmans was an amazing colleague and fellow student. She was an even more amazing person and friend. Nina and I met in the Center for Arabic Study Abroad program in Amman, Jordan in August 2013. In getting to know Nina during the following months, I was struck most by the remarkable combination of austerity and discipline with which she conducted herself and regimented her life on the one hand, and the heartfelt happiness and gentleness of spirit with which she interacted with others and the world around her on the other. Many a weaker person, having subjected him or herself to such a rigorous lifestyle and exacting standards in every endeavor, would have been negatively affected and undergone a hardening of their heart; but not Nina. Nina’s smile and friendliness were contagious and although we did not share any of the same classes that year in Jordan, our meet-ups for lunch or tea, along with chance encounters at the Arabic institute or around Amman, always predictably resulted in a distinct sense of optimism and positivity. Never before had I met someone possessing the grace of balancing the highest level of personal devotion with the authentic humility of accepting the world she encountered and the people in it she met as they were. Nina radiated the joy that comes not only from living, but living well with kindness towards all. Nina and my academic and personal friendships developed in an environment heavily influenced by her characteristic dedication and genuineness of purpose. At a dinner party over Alice Gissinger’s apartment 2-3 months into the program, Nina and I realized that we had not spoken to each other in English, highlighting the seriousness with which she took the pledge to speak in Arabic. Nina also took a sincere interest in my own plans for the future and was elated that I had deferred acceptance to the Arab Studies program at Georgetown University. 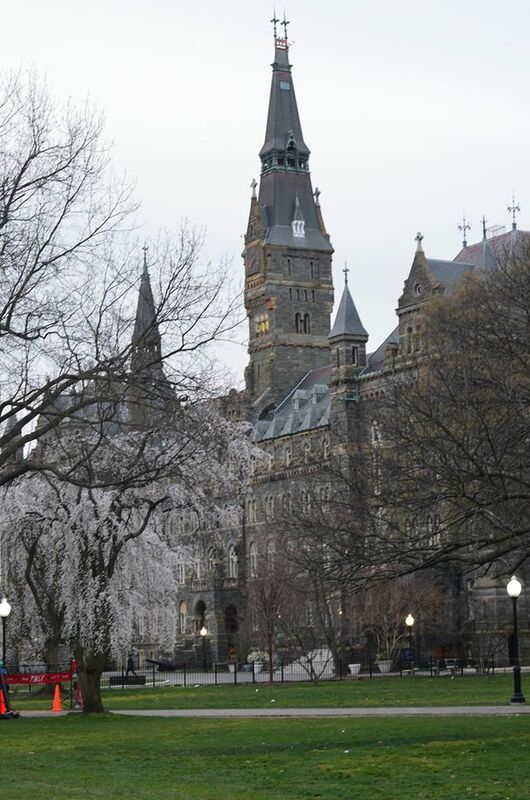 Nina made it crystal clear that she expected me to come back with her to Georgetown and when I officially accepted in April 2014, she greeted me that morning by screaming and jumping up to give me a giant hug, the warmth of which will never grow cold. In word, spirit, and action, Nina’s loyalty to and pride in this university were boundless. I feel blessed to know that I was one of Nina's very close friends. We got to know each other by spending a year abroad together, studying Arabic in Jordan. She and I were different in a number of ways, but something about her beauty, her energy, her intelligence, her friendliness instantly attracted me to her, and over the course of the year, we became very close friends. One of the things I liked most about Nina is that I never had any doubts about the way she felt about people or things. She always made herself very clear. I'm not saying that Nina wasn't complex or indecisive ­­ she was, we all know that. Nina took forever to make decisions. They dragged on and on. But at least, she never pretended to be sure of herself if she wasn’t. When Nina wasn't happy about something, or didn't adore someone, she made it very easy to find out. She was wonderfully simple to be around. If Nina didn't really want to go to your party, she would tell you. If she didn't want to eat your food, she would tell you. If you were giving her too much homework ­­-- or too little homework, for that matter -- she would tell you. It wasn't always pleasant, but at the very least, you never had to worry, or try to guess how she was feeling, or walk on eggshells around Nina. She spared you that effort. Said. Done. And of all the people I have loved this fully, I think I had to worry about Nina the least. I could always trust she was doing her thing and she'd take care of herself. Which is why this particular tragedy, which brought us here together today, is so haunting. Nina forced people to be honest with each other. And if she told you she loved you, and she did that a lot, because she cared for people, she would do it without reserve, without a shred of ambiguity. There was never a question that she meant every word. She would write things like "lots of giant hugs." Who writes things like that? Gail and Nico, thank you for raising such a genuine gal. She was always right there with us. Rob, thank you for all the times you teased and annoyed your sister growing up -- it’s how she learned to stand up for herself. Nina my darling, lots of giant hugs. I will miss you very much. Toya Hasab Allah: This is for Nina’s memory, she loved running very much. She used to be very happy with the races done in Amman. She is a hero, and has a great place in our hearts. Our love for her cannot be quantified and will always remember her. As long as I run, she will always be with me. Ibrahem Abu Asbeh: Nina was a dear friend and colleague. We used always train together. The tragic news has profoundly impacted and upset all of us. We wanted to commemorate her memory through this Race for Charity in her name. We were happy that all her friends attended the run and even people who did not know her personally participated to honor her. Our prayers go out to her and her family. Sharifa and Ashwaq: We are Nina’s friends, and her running partners. We first met Nina here, at Sports City, and we would run together almost daily. Talking about Nina, she brought us together with her persistent, kind spirit that represents a true sportswoman. The smile would never leave her face, no matter her score or run time. As a human being, she is irreplaceable and our loss is great. She is a friend above all else, she would motivate and encourage us. Her voice is still with me, urging us to go on, give it all we’ve got and not care about the challenges. She will always be with us, her spirit is with us. Everything in Sports City reminds us of her. We send our condolences to her family as we try to console ourselves with the loss of such a friend.